I have so many things that I mean to post but never end up getting around to, so this month I will try doing it all at once! 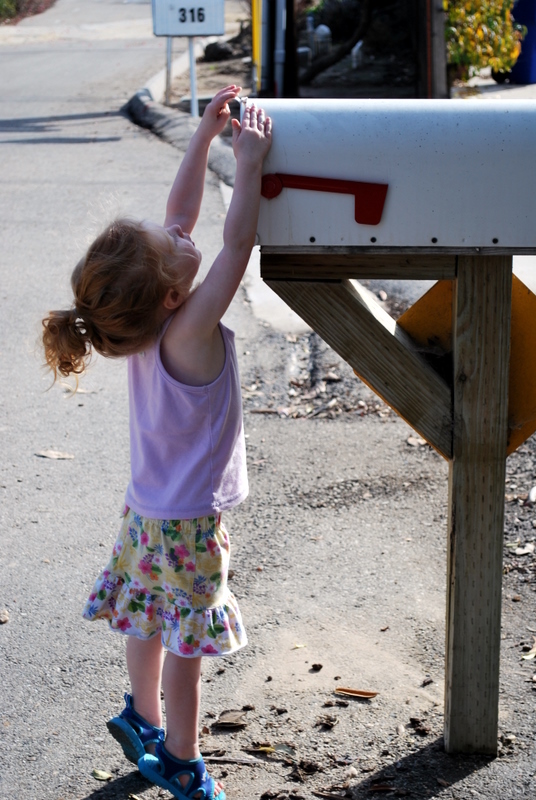 Here is Natalie down at the mailbox to look for Christmas cards. Why is she dressed like we’re going to the beach? Because it was 80 degrees out! 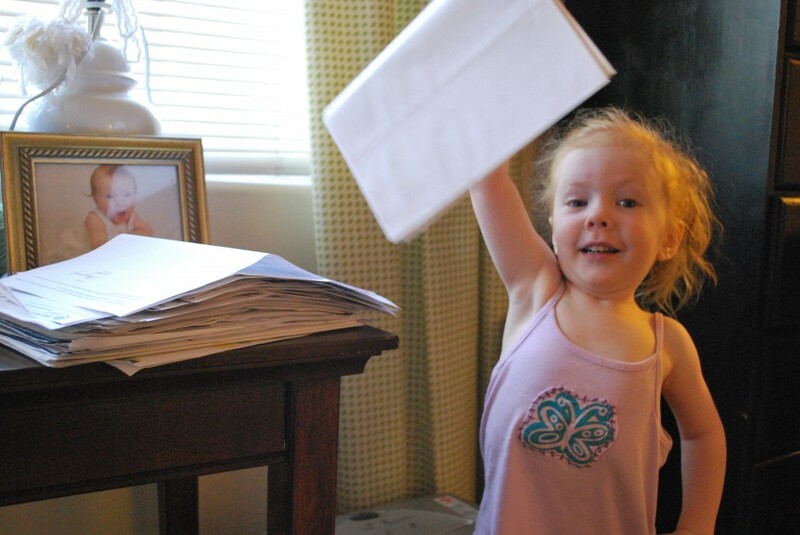 I haven’t been keeping up with paperwork very well since Ben was born, look at my pile of papers to be shredded. 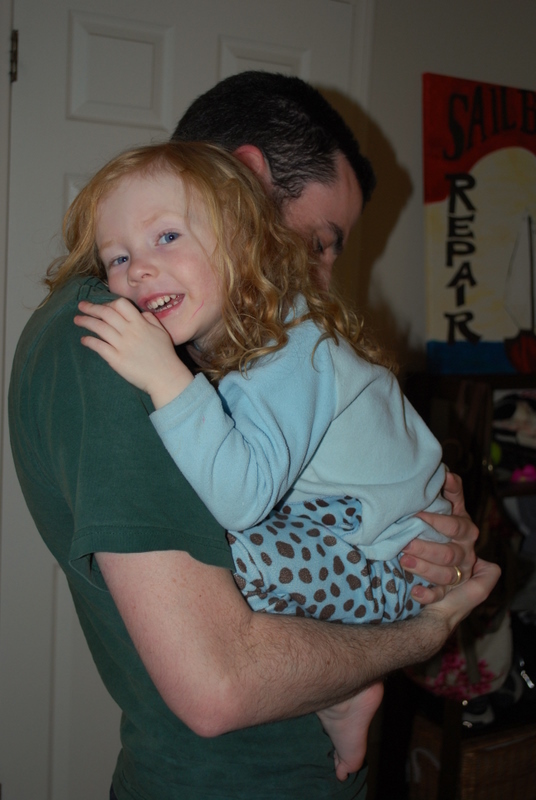 Good thing I have such an excited helper– too bad she needs constant supervision! It would have been easier to do it myself. Oh, and we are still only halfway through, keep having to stop so my poor little shredder doesn’t get overheated and die. 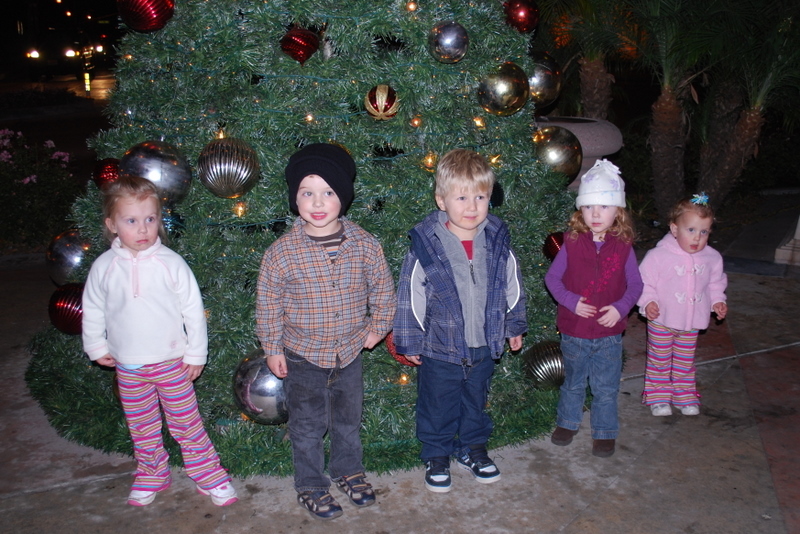 Here’s Natalie and some of her friends down in Old Town Camarillo for the tree lighting, how cute are they? Both kids are at an age where they like to smile for the camera!! Yes!! I love the way Natalie curls up into a ball when Andy takes her to bed after reading to her in our room. She does it the same way every night. I tried to get a picture but of course she started trying to ham it up so it’s not very authentic. We had a nice rainy week this month. 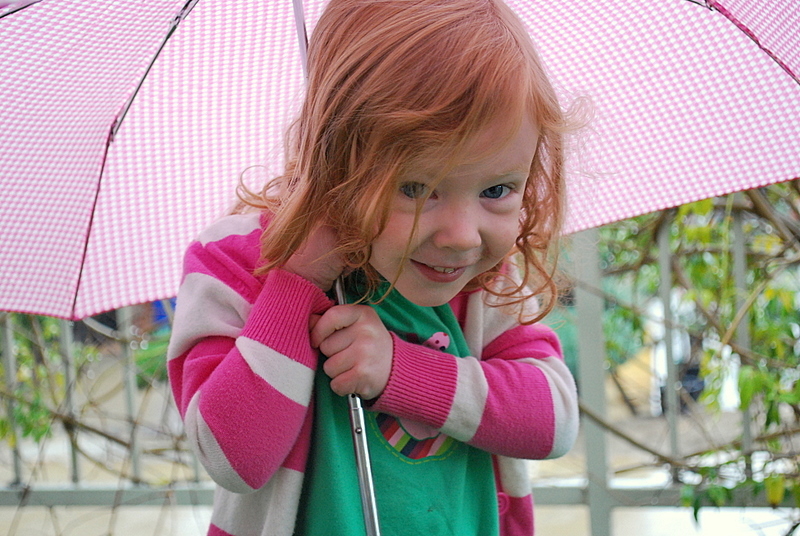 Natalie has been asking for months to play with my umbrella, but I won’t let her because of course it would end up damaged somehow. I told her that we can only use it when it’s raining. So of course when she woke up and it was raining, she was quick to remind me! She was more than a little disappointed when her umbrella didn’t help her fly like in “Mary Poppins”, her current favorite movie which she saw at Grandma’s house! 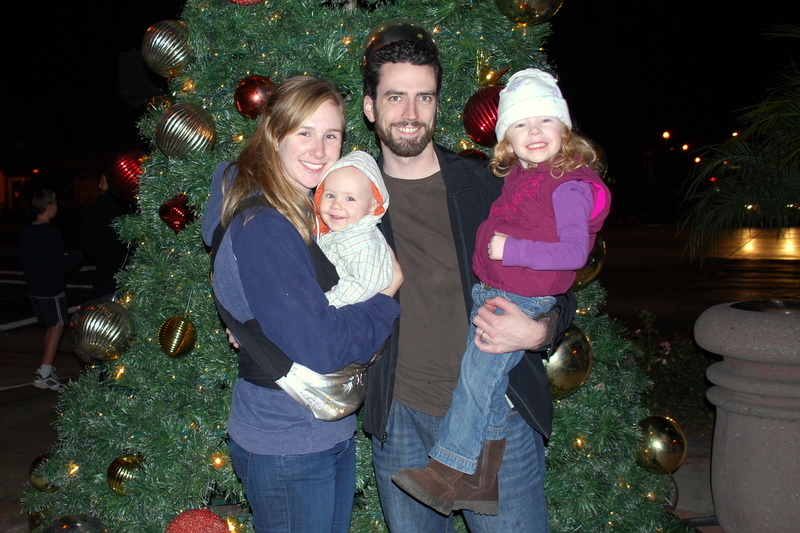 This entry was posted by Mollie on Sunday, December 20th, 2009 at 10:33 pm	and is filed under Life & Times. You can follow any responses to this entry through the RSS 2.0 feed. You can leave a response, or trackback from your own site. Picture overloads are wonderful! And so are the children and family you’ve pictured! 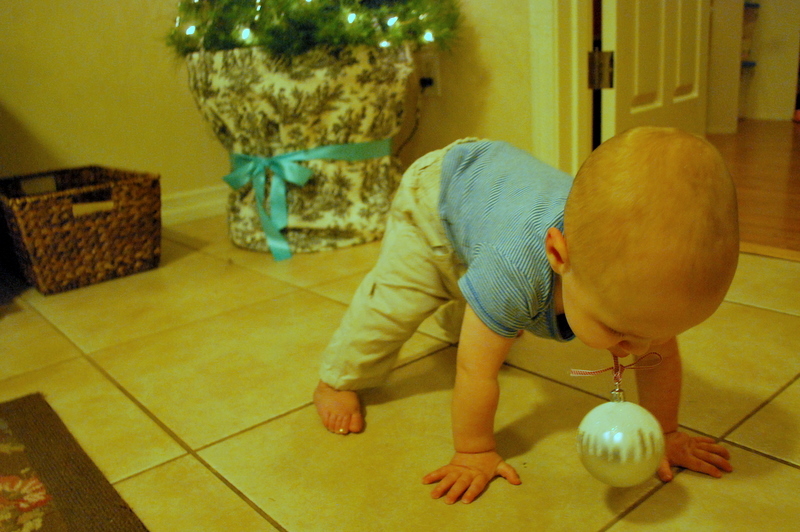 Ben is too precious with his spider crawl. Natalie finds lots of good things to be interested in. Thanks for sharing! I got your Christmas card today and it was just lovely! Such a good photo and a happy family. Thank you for the photo! Maybe I’ll send one out next year…even if it is just the two of us…would that be weird?